The fifth season of Arrow did a lot of work in bringing together a new iteration of Team Arrow. It took time, but Oliver did grow to trust that Wild Dog, Artemis, and Ragman could be good additions to his group. Even when Artemis turned out to be a traitor, Oliver still had the other two and the OG members of Team Arrow to have his back. And multiple times, Rene, Curtis, and Dinah proved themselves both in and out of the field, with Rene in particular being surprisingly loyal and thoughtful for a guy who ran around in a hockey mask. Beneath his large love for burgers and bad jokes is that same guy who would do anything for his daughter and his friends. With that in mind, it doesn’t really come as any surprise that Rene would be the one to sell Oliver out to Samanda Watson if it meant getting to see his daughter. Sure, Curtis’ life has been effectively both rejuvenated and ruined by the Green Arrow, and Dinah would tell anything to her ex-boyfriend turned Vigilante, but Rene suffered a huge blow when Prometheus kidnapped him before he could make an appeal to get custody back. It’s perfectly understandable that he’d do what he did when caught between a rock and a hard place, and it says something about how far the show has come — and how aware they are of how played out stories like this are — that he comes clean almost immediately when Oliver starts grilling the new team members about who the rat could be. Despite its status as a midseason finale, “Differences” is surprisingly low key for a large chunk of its runtime. So much time is rightly spent on focusing on the fallout of Rene’s betrayal between the characters that the kidnapping of Quentin by Black Siren almost feels like it could’ve been just fine in any other episode. Year after year, Paul Blackthorne has shown that he’s the heart and soul of the show, and this episode subtly acknowledges that more than anyone else, he’ll never truly be happy. If seeing Felicity’s mom dance with her ex husband at his surrogate son’s wedding wasn’t painful enough for him, learning that his Earth-2 counterpart wasn’t there for Siren as a child has to have done it. The quiet moment they have remembering different perspectives on the same childhood is both heart-wrenching to watch, and a reminder that he and Katie Cassidy have always done best at the emotional moments together. The show’s definitely doing a slow burn with her eventual heel turn, but I’m invested and willing to let it be as it is. 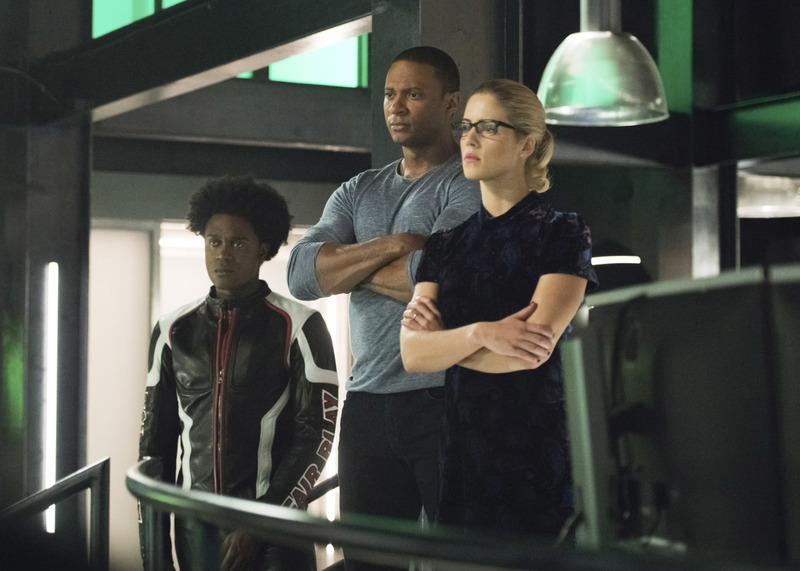 Tensions between the veteran and recent members of Team Arrow have always been there in the background, but this is the first time that things have reached their boiling point. Again, it’s not entirely unexpected that Curtis and Dinah would be upset at the betrayal from the veteran members. Curtis has had resentment against Felicity as of late, and Diggle not having Dinah’s back after all she’s done for him is just all kinds of not cool. The three of them are definitely in the right in breaking off, and their grievances are logical and have been baked in since their respective introductions earlier in the series run. Now, I have no real idea how long the three of them can last on their own. Together, they have their strengths, but they also very much have their weaknesses together as well. However, I’m more than willing to give the show a shot and see where this development takes them. Oliver and company may have been what brought them together, so it’s only fair they’re what breaks the team apart. And not a moment too soon, as it turns out Cayden James has a sizeable roster on his side. It’s not too surprising that either Anatoly or Dragon would turn out to be in league with him, but Vigilante’s is, just for how unconnected he truly seemed to all the madness going on with other criminals. As James says at the end, this is only the beginning, and things are certainly in an interesting place when Arrow returns next month. It’s weird how no one thought to sweep the Bunker for bugs after Siren raided it back in the season opener. These guys can be thick, but they shouldn’t be that thick. Rene: “Hey, maybe you should chat up the DJ–” Thea: “Nope, had a bad experience.” That’s one way of putting it. Oliver and Felicity’s wedding ceremony is fine for what it is, but the best moments come when someone is throwing shade at the couple for doing it without telling anyone beforehand. “I am a man of my word…I couldn’t threaten to destroy the city otherwise, could I?” Michael Emerson, you are a welcome addition to this cast. New episodes start back up in January. See you all then!